The Courage of Ananias Acts 9:10-22 Courage: “Mental or moral strength to venture, persevere, and withstand danger, fear or difficulty” (Webster). Deuteronomy. 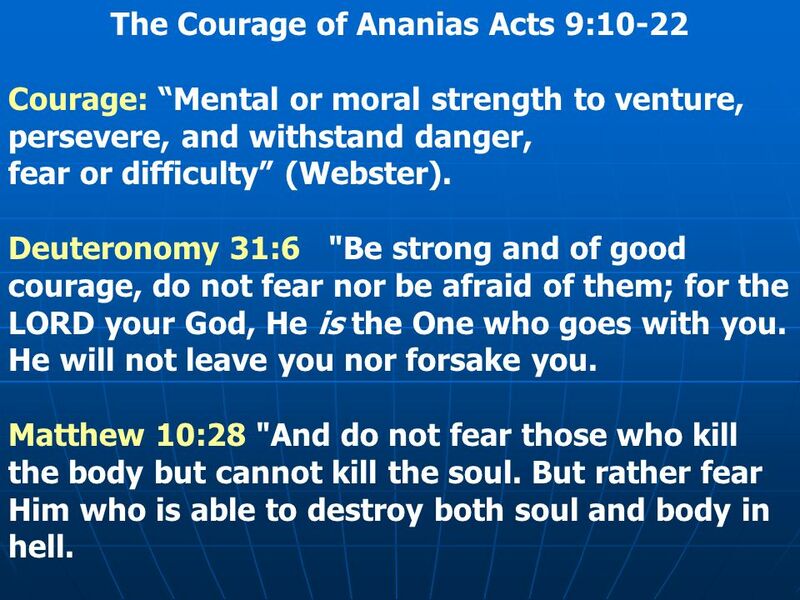 1 The Courage of Ananias Acts 9:10-22 Courage: “Mental or moral strength to venture, persevere, and withstand danger, fear or difficulty” (Webster). Deuteronomy 31:6 "Be strong and of good courage, do not fear nor be afraid of them; for the LORD your God, He is the One who goes with you. He will not leave you nor forsake you. Matthew 10:28 "And do not fear those who kill the body but cannot kill the soul. But rather fear Him who is able to destroy both soul and body in hell. 2 Proverbs 28:1 The wicked flee when no one pursues, But the righteous are bold as a lion. 1 Corinthians 16:13 Watch, stand fast in the faith, be brave, be strong. 14 Let all that you do be done with love. Colossians 4:6 Let your speech always be with grace, seasoned with salt, that you may know how you ought to answer each one. 3 I. 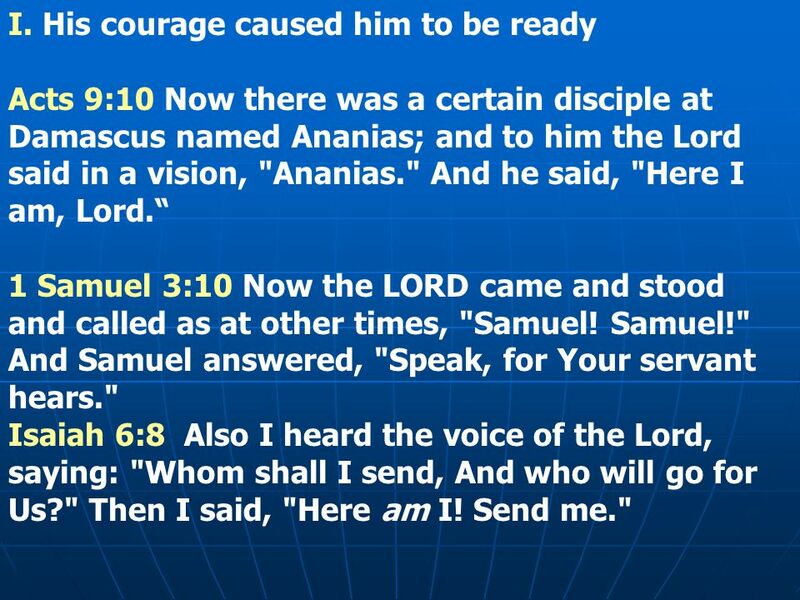 His courage caused him to be ready Acts 9:10 Now there was a certain disciple at Damascus named Ananias; and to him the Lord said in a vision, "Ananias." And he said, "Here I am, Lord.“ 1 Samuel 3:10 Now the LORD came and stood and called as at other times, "Samuel! Samuel!" And Samuel answered, "Speak, for Your servant hears." Isaiah 6:8 Also I heard the voice of the Lord, saying: "Whom shall I send, And who will go for Us?" Then I said, "Here am I! Send me." 5 2. We need to be ready to preach the gospel to others. 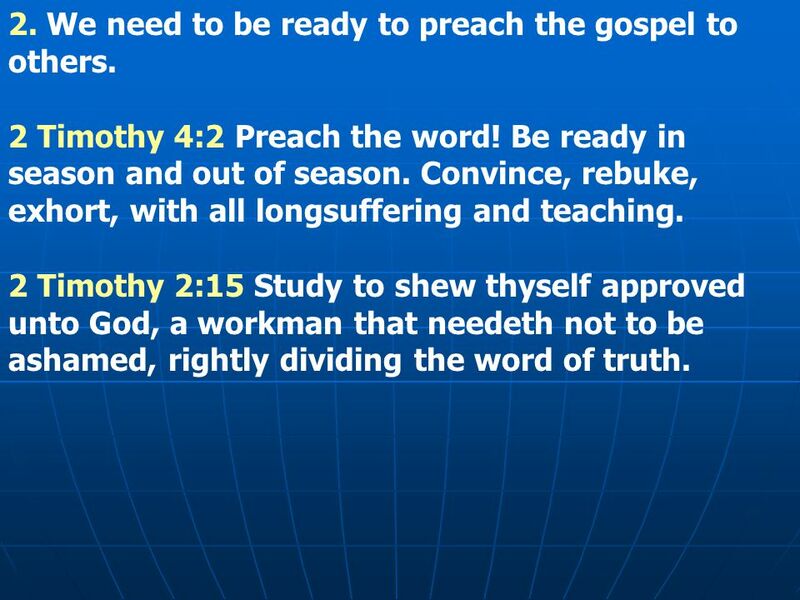 2 Timothy 4:2 Preach the word! Be ready in season and out of season. Convince, rebuke, exhort, with all longsuffering and teaching. 2 Timothy 2:15 Study to shew thyself approved unto God, a workman that needeth not to be ashamed, rightly dividing the word of truth. 6 3. 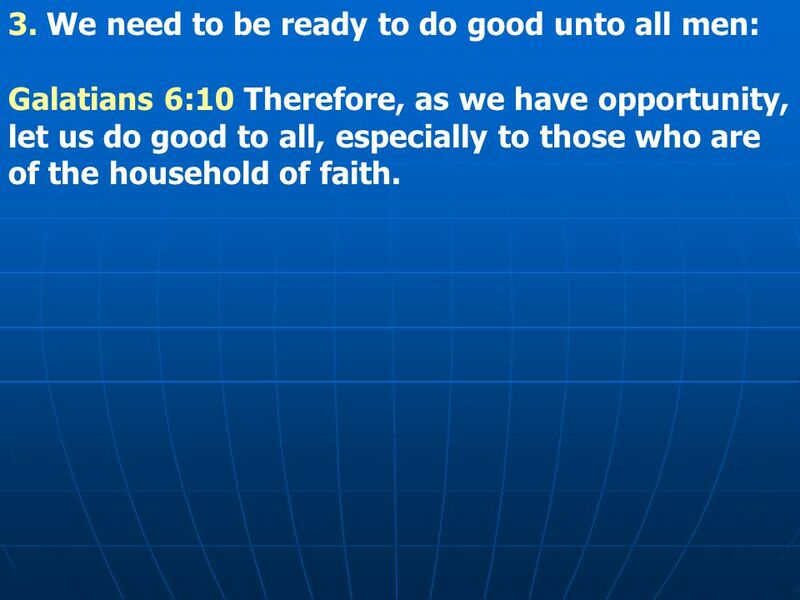 We need to be ready to do good unto all men: Galatians 6:10 Therefore, as we have opportunity, let us do good to all, especially to those who are of the household of faith. 7 II. Sometimes courage requires deep thought. Acts 9:11 So the Lord said to him, "Arise and go to the street called Straight, and inquire at the house of Judas for one called Saul of Tarsus, for behold, he is praying. 12 "And in a vision he has seen a man named Ananias coming in and putting his hand on him, so that he might receive his sight." 13 Then Ananias answered, "Lord, I have heard from many about this man, how much harm he has done to Your saints in Jerusalem. 14 "And here he has authority from the chief priests to bind all who call on Your name." 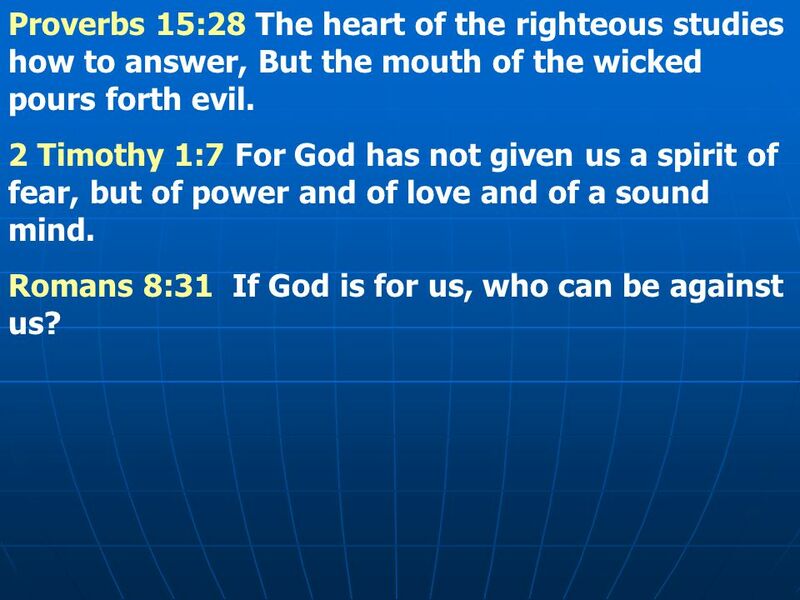 8 Proverbs 15:28 The heart of the righteous studies how to answer, But the mouth of the wicked pours forth evil. 2 Timothy 1:7 For God has not given us a spirit of fear, but of power and of love and of a sound mind. Romans 8:31 If God is for us, who can be against us? 10 III. 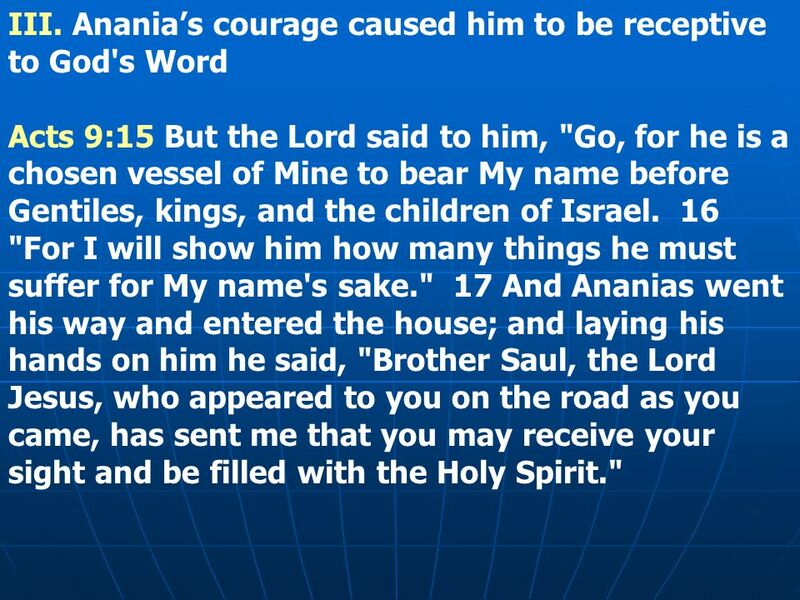 Anania’s courage caused him to be receptive to God's Word Acts 9:15 But the Lord said to him, "Go, for he is a chosen vessel of Mine to bear My name before Gentiles, kings, and the children of Israel. 16 "For I will show him how many things he must suffer for My name's sake." 17 And Ananias went his way and entered the house; and laying his hands on him he said, "Brother Saul, the Lord Jesus, who appeared to you on the road as you came, has sent me that you may receive your sight and be filled with the Holy Spirit." 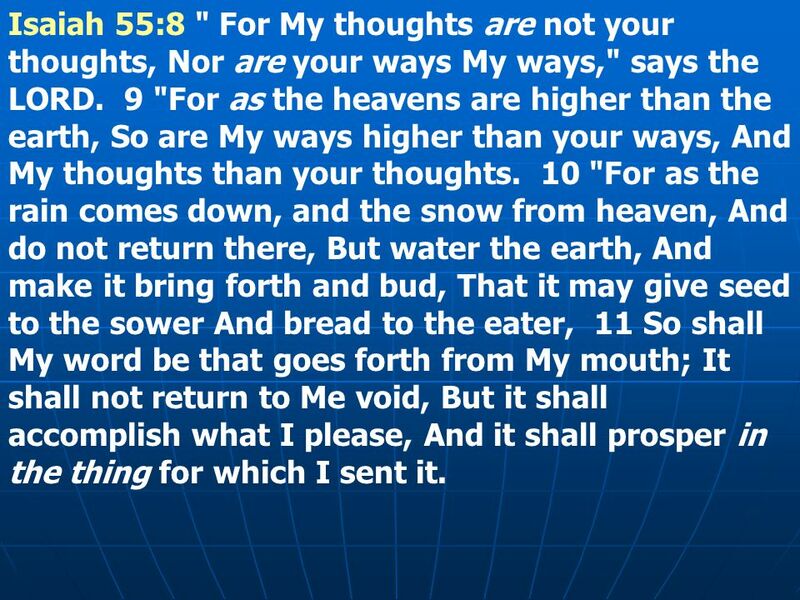 11 Isaiah 55:8 " For My thoughts are not your thoughts, Nor are your ways My ways," says the LORD. 9 "For as the heavens are higher than the earth, So are My ways higher than your ways, And My thoughts than your thoughts. 10 "For as the rain comes down, and the snow from heaven, And do not return there, But water the earth, And make it bring forth and bud, That it may give seed to the sower And bread to the eater, 11 So shall My word be that goes forth from My mouth; It shall not return to Me void, But it shall accomplish what I please, And it shall prosper in the thing for which I sent it. 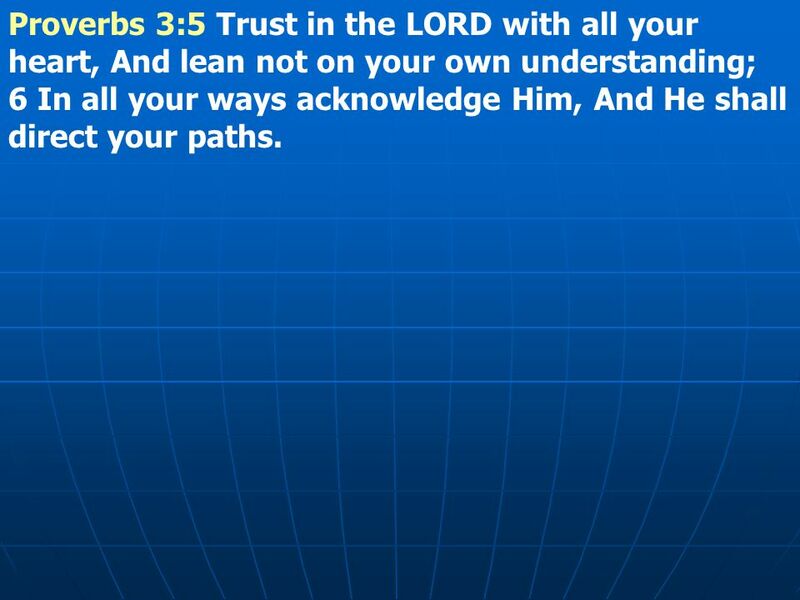 12 Proverbs 3:5 Trust in the LORD with all your heart, And lean not on your own understanding; 6 In all your ways acknowledge Him, And He shall direct your paths. 13 IV. 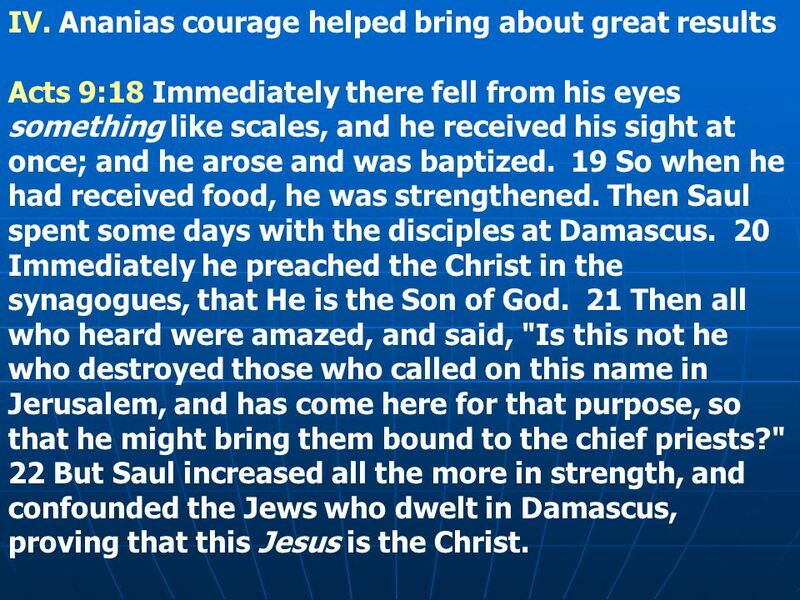 Ananias courage helped bring about great results Acts 9:18 Immediately there fell from his eyes something like scales, and he received his sight at once; and he arose and was baptized. 19 So when he had received food, he was strengthened. Then Saul spent some days with the disciples at Damascus. 20 Immediately he preached the Christ in the synagogues, that He is the Son of God. 21 Then all who heard were amazed, and said, "Is this not he who destroyed those who called on this name in Jerusalem, and has come here for that purpose, so that he might bring them bound to the chief priests?" 22 But Saul increased all the more in strength, and confounded the Jews who dwelt in Damascus, proving that this Jesus is the Christ. Download ppt "The Courage of Ananias Acts 9:10-22 Courage: “Mental or moral strength to venture, persevere, and withstand danger, fear or difficulty” (Webster). Deuteronomy." 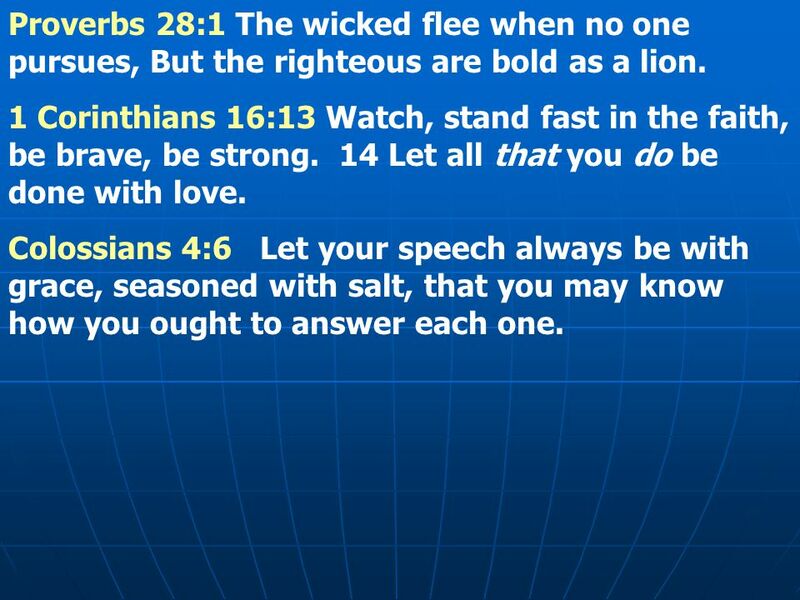 How to Study the Bible Lesson 3/4 What Do I see different in the following passages when looking at them from a different version? Genesis 2:4-25 Psalm. The Body of Christ – The Church Based on Alive-O 6: Term 2, Lesson 3 Refer to Teacher’s Book pp What am I trying to do? To explore the image of. Why I am a member of the church of Christ because it teaches the Biblical way of Salvation. Acts 2:36-41. SSSSaul saw and spoke to Jesus on the road to Damascus. Beyond belief a study of salvation. John 3:5 5 Jesus answered, Verily, verily, I say unto thee, Except a man be born of water and of the Spirit, he cannot. Acts 9:1-22 Pastor Keone. Acts 9:1-9 Saul’s Conversion 1 Meanwhile, Saul was still breathing out murderous threats against the Lord's disciples. He went. Book of Acts Chapter 9. Acts 9:1 But Saul, still breathing threats and murder against the disciples of the Lord, went to the high priest. 1 Acts Class Schedule. 2 The next major section of Acts: 6:8 to 9:31 Three significant events in the life of the church The martyrdom of Stephen - Acts. 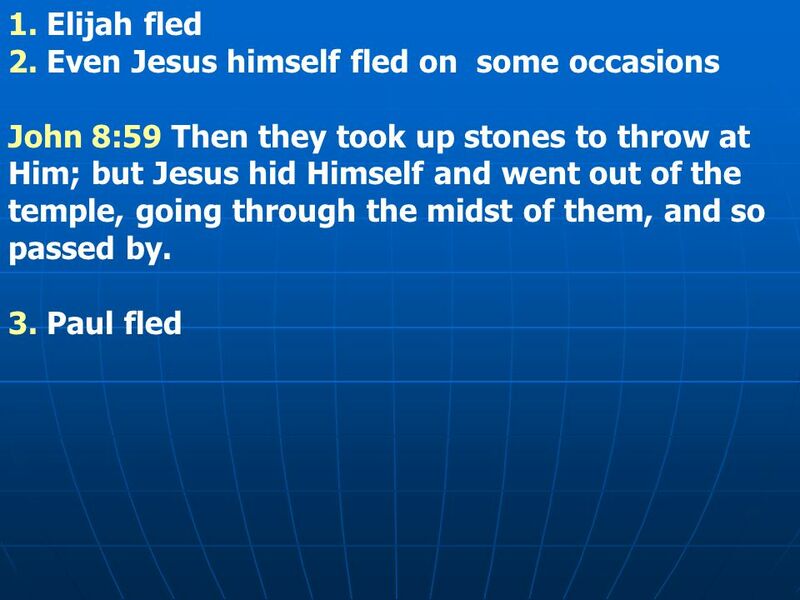 Cases of Conversion When Was Saul Saved?. 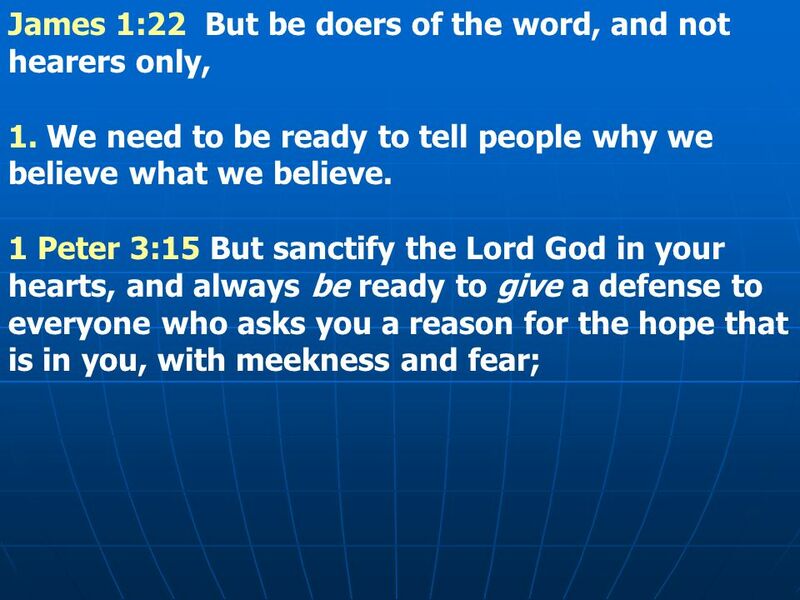 2 Introduction Most important question, “What must I do to be saved?” Sadly often wrongly answered Example of. Holy Spirit Does the Impossible. “Past behavior is the best indicator of future behavior.” If this is true where is the hope for: The bad marriage? The. ARE YOU READY?. Sometimes we can have good intentions on being ready to serve God, but it doesn’t always work out how we initial planed. Transformed! “The Defender” Galatians 1:18-24 By: Sam Caloroso. True Obedience Guest Speaker: Pastor Mike Choi Acts 9:1-19. What leads your life? Are you driven by other people’s expectations?